Ordained FSM Ministers are everywhere and our numbers are growing every day. I’m happy to report there are now Ordained FSM ministers in 26 countries, and most of the US states . Quite a few of our ministers have successfully jumped the bureaucratic hurdles to receive wedding officiant licenses in their various jurisdictions. I’ll try and make a map showing all of our locations. I know of perhaps 8 weddings coming up that will be presided over by a Pastafarian minister in full pirate regalia. I could not be more pleased. Aside from a few document requests and "is this a joke?" phone calls I received from clerk’s offices, there has been little resistance to handing licenses to perform weddings to Pastafarians. I interpret this as approval – maybe even endorsement – from our government. FSM bless America. Where will we go from here, and what other privileges do ordained ministers enjoy that we can get in on? Someone told me there are special license plates available for members of the cloth. That’s something to look into. If you want to be ordained, here’s the link. Price is still dirt cheap, just $20/$30 including shipping. I think the world is better off with a huge number of FSM Ministers around. I see there’s a new Audi called the LBGTQ. I think that stands for, “Long wheelBase Grand Touring Quatro”. I already knew about the LBGT but I didn’t know it came as four wheel drive as well. My town has a group of old ladies who call themselves Grey, Thespian and Bi-saxual (one of them has two saxophones). No doubt it’s only a front for their sordid activities. I would think more ‘German’ for the car’s real purpose. 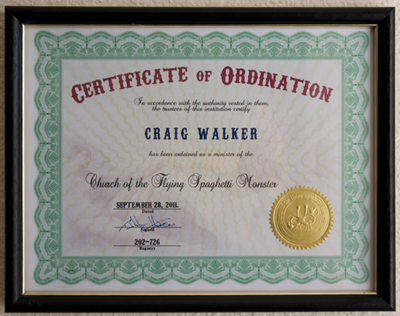 Am I still ordained in FSM?